One of the themes we heard repeatedly at the Radical Independence Conference this weekend was calls for nationalisation: nationalisation of the banks, of Grangemouth, of the oil industry. This makes me very cautious. Of course, conference speeches are not places for nuance, for detail. It's possible that those who urged nationalisation did not mean the statist, centralising nationalisation of 1945. So I'm cautious rather than hostile. My intention in this essay is to set out the reasons that I'm cautious. This isn't to criticise anyone; it isn't to be hostile to anyone. As Dennis Canavan said, we must keep our eye on the ball; we must achieve independence, and to do that we must work together as a broad front. We don't need schisms, splits. I'm not seeking to promote those. I'm seeking to start a discussion. In this essay I use 'elite capture' as shorthand for the propensity of well-connected influential elites to establish themselves in positions of power and benefit in institutions and schemes set up for the public good, or for the good of specific minorities. For example, what is known as 'the quangocracy' or 'the great and the good' are well connected elite groups who establish themselves in positions of profit in many public bodies within Scotland and the UK generally. Nationalisation - the concentration of the whole of an industry within a nation into a single unit owned by that nation - provides a target for elite capture. Western experience of industrial organisation is to have decision making power concentrated at the top, in 'the board'. Elites have many excellent and well-developed strategies for the capture of key concentrations of power. Creating large new top-down structures within society, with control over key economic assets, is just inviting elite capture. It's natural human behaviour - normal, obvious, we all do it - to advance people we know, people we trust, people like us. When this happens in recognised elites - the soi-disant aristocracy, or the 'old school tie' of the public school. But the same mechanisms operate on the left; and there are what I would describe as 'right elites' as well as 'left elites' in the British Labour movement. There are twenty-seven members of the current Westminster shadow cabinet, and actually, when you look at their records, they're a pretty impressive group of people. Jon Trickett is a plumber to trade, a long time peace campaigner, an anti-fascist, and came up through the trades union movement to become a councillor in his home town of Leeds before being elected to parliament. Steve Bassam, a social worker, founded a squatters union and campaigned for the rights of squatters and the homeless, before serving on his own local council and then in parliament. Ivan Lewis set up a learning difficulties support charity at the age of seventeen. He, too, served on his local council before being elected to parliament. Many of them are clearly exceptionally bright. Mary Creagh, Andy Burnham and the twins Maria and Angela Eagle were all working class kids who went to Oxbridge. Rachel Reeves may also be - I don't have information on her background, but she was certainly educated at New College, Oxford. Indeed, nine of the twenty-seven - one third - went to Oxford or Cambridge, and there's the first part of the rub. Four of them - through no fault of their own - had parents who were already members of the British elite. Six of them went to fee paying schools. Thirteen of them - almost half - have never worked outside politics and the Westminster village. Taking the intersection of those sets (oxbridge or elite parents or fee paying school or never worked outside politics), nineteen - two thirds - can be classified as elite. Admittedly, that's a crude score; admittedly, as I've said before, many of these - most of these - are pretty impressive people. But what they are not is the labour movement. What they are not is 'workers'. True, the nature of work has changed over the past fifty years. Fifty years ago, the Labour front bench contained miners, steelworkers, shipbuilders. We can't expect to see such trades now, as industry has vanished from the landscape. But we have one plumber - one! One social worker, an administrative worker, a school teacher, a television journalist, a radio producer. Those, we can all accept are real jobs, and more, real work. Workers' jobs; labour, if you like. Six of them. For the rest, one economist; four academics; only five lawyers. All the rest are wonks. I would argue that for the most part the Labour front bench are for the most part a 'right elite'. They have, like their Conservative opposite numbers, succeeded at least partly because they are members of old elite structures - inherited privilege (Hilary Benn, Ed Milliband, Hariet Harman, Yvette Cooper); oxbridge or private school; direct entry into politics. Yes, they are polished, impressive people: elite education does that for you. Put them on a panel of potential parliamentary candidates alongside an engineering worker just off back-shift and of course they'll shine. But there's more to it. Those old elite structures have had hundreds of years to develop the - unwritten, unthought, even unconscious - practices of elite capture. Joyce McMillan is of course, perfectly right to argue that the Flowers affair has been blown out of proportion by the right in order to attack the left. However, the Flowers affair has recently highlighted a different sort of elite structure, one which is more clearly a matter of the left. Paul Flowers rose through the ranks of the Labour and Co-operative movements despite the fact that he was frequently discovered to be either useless or a liability. Like Buggins, he was simply shuffled sideways into other posts until he ended up in one in which he could do real damage. Paul Flowers represents a different sort of elite, a left elite, a consequence of the organic development of the left in Britain. What this reveals is the systematic democratic deficit in old British left structures. The left, although it claims to be (and, to be fair, largely aspires to be) democratic, grew up in the Victorian period when telecommunications either didn't exist or else were out of the economic reach of working people. It was natural in the Victorian period to develop a hierarchical system of organisation, with local chapels or branches at the bottom, sending delegates to regional committees which in turn sent delegates to the (national) executive committee. Not every trades union member, of course, makes it to branch meetings - when I was an apprentice printer and a member of the National Graphical Association, we were fined if we failed to attend chapel meetings (and the fines, like our union dues, were deducted from our pay before we got it), but we were not told when or where chapel meetings would take place. The only way to find out was either to be at the preceding meeting, or be told by a friend who had been. But even ignoring such obvious abuses, the reasons why members may not attend branch meetings are not always just apathy. Union branch meetings tend to run to a formula, and are commonly pretty turgid affairs which take up a lot of an evening. They are often not designed to be inclusive, to be welcoming to the rank and file membership. They tend to select 'in groups'. But it tends to be branch meetings, not the membership as a whole, who elect delegates to area committees. It tends to be only those delegates who have much contact with the delegates from other areas, so even in those unions where delegates do constitutionally take instruction from their branch on whom to vote for in elections to national committees, the opinion of the branch delegate is likely to be very influential in the branch's choice. And so it goes. Most trades unions are not participatory democracies. They're not even representative democracies. They're multi-tiered representative democracies, and at each tier the electoral college gets smaller and more self selecting. Of course, in the Victorian period when these structures were established, most trades unions were small, with a few thousand members at most; the process of consolidation and amalgamation over the past hundred and fifty years has further concentrated power, further increased the separation between the people with power - the national executives and general secretaries - and the ordinary membership. In an electronic age it doesn't have to be like this and increasingly unions do hold direct elections; but the very size of modern unions means that the candidates for office cannot be known to a significant proportion of the membership, so elections - like elections to parliament - have to be on the basis of leaflets of a few thousand words, and such exposure as the candidates can manage to get themselves in trade journals and in the national media. One of the things which has also badly affected democracy on the left in Scotland has been egos and personality cults. I haven't been directly involved in any of these and I don't really understand the dynamics of them so I won't attempt to analyse the problem but I think we can all accept that it has existed, and that it has tended to act in anti-democratic ways. The EU has a concept - called subsidiarity - that decisions ought to be taken at the most local practical level of democratic control. Smaller, more local, is inherently more democratic. Of course there are risks of elite capture, petty corruption and cronyism in small local structures just as there are in large, national structures, but such issues cause less damage precisely because they are more local. So what I want to argue is that there are smaller, more local, forms of industrial organisation which democratise control far better than crude old-fashioned nationalisation. The petrochemical installation at Grangemouth, and the shipyards on the Clyde, present particular difficulties for the general solution I propose to the problem of concentration of power and of elite capture, so I'll attempt to characterise those problems before going on to talk about more general issues. As I understand it the petrochemical installation, although currently divided into two separate functional units ('refinery' and 'chemicals plant') is essentially one integrated facility where the parts are largely dependent on the whole and cannot easily be operated or managed separately. Furthermore, it is as I understand it key to the mechanisms which drive the oil along the undersea pipelines which bring it ashore. It's a big deal, a big plant, and important to the nation. Furthermore, it can't reasonably be expected that its workers can, from their own resources, raise the price of new investments when they become necessary. So it depends inherently on outside sources of finance. This being so one cannot realistically reorganise the plant into a collection of human-scale workers co-ops. Even if you divide it into one co-op for refinery operations, one co-op for chemical operations, one co-op for engineering and maintenance (for example), you still require overall co-ordination. And you require relationships with external investors/lenders, whether those investors/lenders be conventional venture capitalists, a national investment bank, or a collection of mutual banks. Whoever the lenders/investors are, they will need an effective input into top-level decision making. So you inevitably end up with something which looks very much like a top-down board of directors. If we are to maximise national income from the oil we choose to extract from the North Sea, we need Grangemouth. Making Grangemouth work is a bullet we have to bite. The shipyards are similar, if not necessarily such an extreme case. A shipyard, like any other large industrial site, has a penumbra of sub-contractors, and those sub-contractors can in general easily be workers co-operatives. Ships are, these days, largely built of modules, and the group of workers who build a module is not necessarily very big. And, in any case, it's likely that in future we will put the marine engineering skills of the Clyde more into building offshore energy generating plant than into building large warships, so again the units of labour do not necessarily need to be as large. But so long as we are building very large engineering systems on the Clyde, there does need to be some co-ordination. There also needs to be lending or investment. So the Clyde shipyard may need more organisational structure than simply loose associations of small and medium sized workers co-ops. However, these are extreme cases, and we should not build our overall industrial strategy on extreme cases. Most industrial enterprises in Scotland have at most a few hundred workers; organising these as independent workers co-ops is not hard to imagine. The United Kingdom has a small number of very large banks - banks which are deemed 'too big to fail'. We have had very few mutual banks, of which the largest - the Co-op Bank - has just failed. Germany by contrast has many Volksbanken - literally banking co-ops - and, additionally, 431 municipal savings banks and eight state-owned Landesbanks. This is in addition to private sector banks. As several people at the Radical Independence Conference pointed out, the largest banks in Scotland already are publicly owned. They easily could be nationalised. Yes, indeed they could, but they'd still be too big to fail and they would still be targets for elite capture. Rather than centralising that power as national banks, they could be broken up into their individual branches and given to their account-holders as mutuals or to their workers as workers co-ops. Either way, both account holders and workers have clear common interest in ensuring the stability and profitability of the bank they directly own, so have a clear interest in making sure it is well run. And these individual, small banks would not be 'too big to fail'. Banking regulation would still be needed to monitor that not too many of these many small banks were choosing to run the same risks at the same time, but it could be fairly light touch because the consequence of individual banks failing would be manageable. In particular these small mutual banks must be empowered to invest in Scottish industry, and, in order to make large investments where those are needed, they must be empowered to combine into associations to make particular large loans or investments. Workers co-ops are already a well understood concept in Scotland and are supported as a matter of policy by the Scottish Government and more widely by voices on the left. Rather than nationalising industry, I would far rather see the state set up a series of workers co-ops, each of such a size that the members of the co-op can all know one another at least by sight and reputation - so not more than say one thousand members. Obviously, as I've suggested above with Grangemouth and Govan, for some key industries it may be necessary in some key industries to have some co-ordination between groups of co-ops to allow for efficient running of very large industrial assets, but this should be exceptional not normal. Big may be efficient but it is not always beautiful, and in my opinion there is some trade off between raw efficiency and democratic control. Less wealth spread more evenly may be better than more wealth captured by elites. Further, I'm not proposing that private industry should be seized and collectivised overnight. I'm suggesting that key industrial assets in which the state has a strategic interest (e.g. 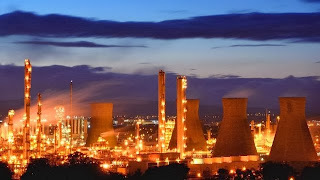 Grangemouth, Govan) should be; and that generally, where the state has a controlling interest in an enterprise (for example Prestwick Airport) there should be a presumption that it will be reorganised as a workers co-operative. Finally I think it would be a good thing if the state provided some systematic incentive for industries to re-organise themselves as workers co-ops; for example, there could be significantly lower levels of corporation tax for co-operatives. I do understand why under current circumstances people are calling for nationalisation. Capitalism is out of control and a wholly unreasonable proportion of the common wealth is being captured by a few elite bankers and venture capitalists. But nationalisation not only isn't the only possible solution, it in its turn offers targets which elites - very likely the same elites - will capture. The alternative which puts power right in the hands of the people most closely involved in it are loose federations of small mutuals and workers co-ops; and I believe it would be as easy to create these as monolithic nationalised industries.